This year, the Twitter beagles ("tweagles") from all over the world got together and exchanged gifts in a Secret Santa Beagle. 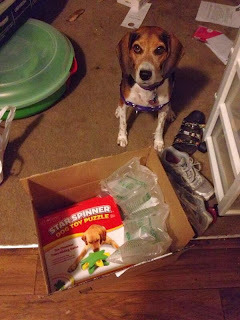 If you check out #secretbeagle, or #secretbeaglerevealed on Twitter, you will find pictures from all the beagles with their gifts. Lulu with her secret beagle gift from Schroeder. Secret beagle was the organized by Andrea Reid and her beagle Jello. So Jello is our Beagle of the Week! We adopted Jello on February 27, 2013 - it's almost been a year! 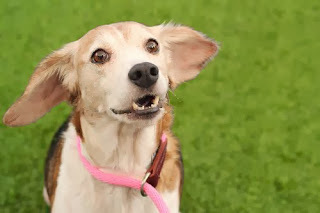 Jello was adopted from the Columbia-Greene Humane Society in Hudson, NY where she was born on New Year's Eve. The shelter found homes for all of Jello's littermates AND her mom - we keep in touch with many of them on Facebook! She was originally given the name "Tornado" because of the funnel cloud shaped marking on her back. Believe it or not, Jello loves healthy snacks! Watermelon, green peppers and slices of clementines. If I act excited about her getting it, she'll be excited to eat it! She really enjoys anything that makes a loud crunching noise when she chews. Oh, and she loves the treats she gets at the Panera drive-through window. We use pieces of string cheese for training rewards. Her regular meals are Royal Canin. Jello is a fantastic climber; she is amazingly limber and agile. We call her a "Cat-Dog" because of how much she likes to walk along the back of the couch, perch on the windowsills, and climb on the countertops! Her balance is incredible! She was featured on The Daily Puppy in June and has over 330 followers on Twitter. Definitely the affection! 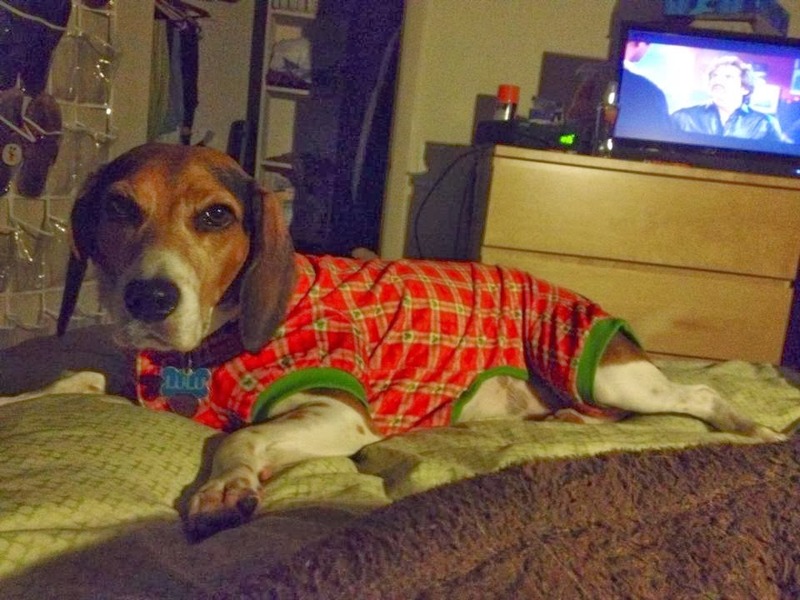 Jello is a super-snuggly beagle who has to be tucked right against you when she sleeps. Her favorite napping spot when I'm on my laptop is to lay directly on my lap and plop her head directly on the keyboard - we've sent many an "oops" e-mail that way! At nighttime she burrows under the covers behind your legs, and then slowly throughout the night makes her way up to my pillow which I end up sharing with her. Beagles are also such curious and attentive creatures - it's a joy just to take her on a walk and see her respond to all of the scents and sounds. You can really see the expression in their eyes. 8 ) What's the worst part of owning a beagle? For us right now, I'd say it's the energy level, especially as we head into her first winter. 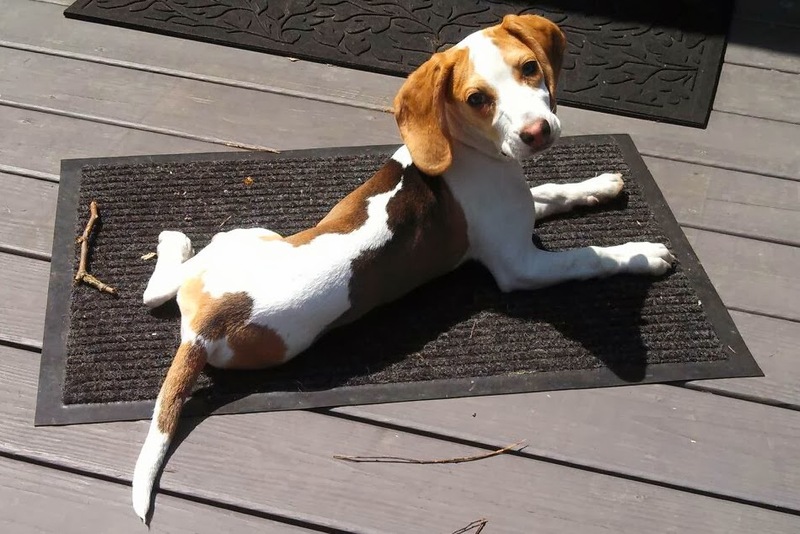 Having a one year-old beagle in cold weather has been challenging as we don't have her outside as much, and so she's trying to burn off that extra energy in our not-that-large of a house. She is constantly running, jumping, chewing, and just wanting to play. And if she has any of that energy lingering when it's bedtime, she becomes a very difficult puppy! My husband and I both work during the day so we make sure Jello gets plenty of exercise during the week from our amazing dog walker Matt, and she also goes to doggie daycare a few days a week! 9) Anything you'd like to add (including if your beagle has a blog or a facebook or twitter account)? Jello loves her Twitter pack ("Tweagles") - this year we've all done a calendar, and a worldwide Secret Beagle gift exchange for Christmas! 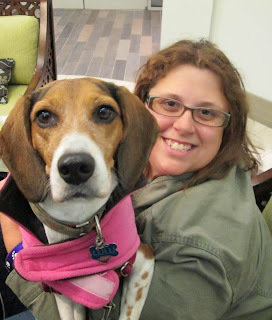 You can follow her at @JelloBeagle and join our pack! I couldn't get all four of them together, so we did this instead. Merry Christmas from Jasmine, Buster, Cappy, Lulu and me! We're going to take the next couple of days to spend Christmas with our family, but we'll be back! Hope you have a great holiday! Alfie is not a beagle, but he can be mistaken for one. 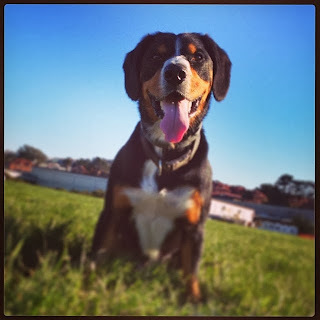 He's an Entlebucher Mountain dog. And he's my Secret Santa dog. Alfie is a well-traveled dog. He's been to Holland, England and now he lives in California. You don't see a lot of Entlebuchers around, but they are pretty awesome dogs. They are herding dogs from Switzerland. Alfie is awesome. Not only does he have his own blog, which you can find at Alfie's Blog.com, he also talks about the best toys to catch and chase, and running in parks! He also takes part in the Monday Mischief blog hop, so he is an expert in doggy mischief making, and teach your dogs a few things. 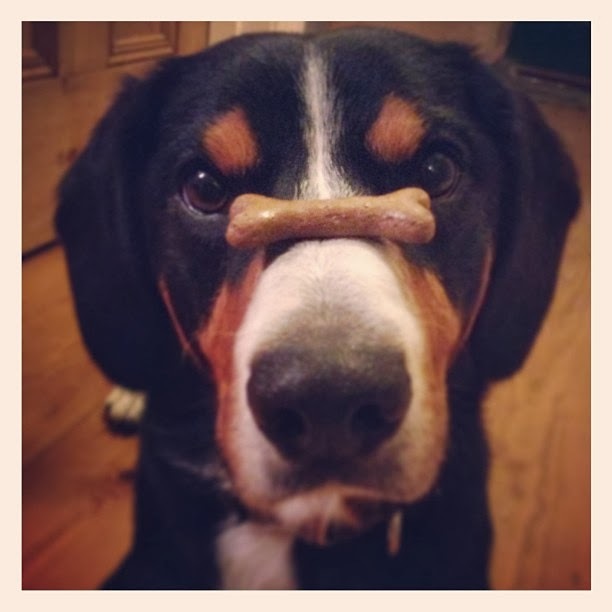 As you can see, he's also quite talented! And if you go to the blog, check out his shop! Tons of cute stuff! I talk a lot about Lulu and Galadriel and all things dogs and cats. But outside of my little About Us paragraph, there's not a whole heck of a lot you may know about me. Well, pet bloggers everywhere are taking part in a Meet the Bloggers Hop today! So here's my answers to some questions. I can't really say I have an absolute favorite of anything. I read a wide variety of things -- Harry Potter, Tolkein (I read The Silmarillion in 12 hours), biographies, lots of history books on England and Imperial Russia, the classics. Since it's Christmas time, I will pick one of my favorites in particular: A Christmas Carol by Charles Dickens. I can quote it. I've seen 20 different versions of the book in movies and television. I think I have three copies of the book. I think it's message is as true today as it was 100 years ago... which is sad. UPDATE: I should add the Despicable Me series. I ADORE these movies. Languages. I used to be pretty good, but if you don't use it you lose it. I envy Sarah Allen, Carma Poodale Allen's sister. She knows lots of languages and is studying to be an interpreter. I also wish I was better at computer languages too. Then I could make my blog better. And I could do with better financial planning skills. Just things I need to work on. Blog! Ha! But then I also collect Disney stuff -- particularly pins and Vinylmations. My favorite character is the villain from Sleeping Beauty, Maleficent. And I'm a big shopper, ha! And I can be pretty crafty. I love to paint figurines. I can make jewelry. I've tried my hand at sewing and other crafty things. Oh, and I'm a bit of a Lego enthusiast. I have a table for Legos. I want to be one of those awesome people who build those huge Lego sculptures. Working for Lego is one of those things I want to do before I die. Oh my -- I love getting a new haircut. I don't do it very often, but I love how it feels. And since I love my hair, it just really boosts my self-esteem. I also love the feeling when I've taken a great picture or posted a story and I'm really proud of what I'm done, especially when other people agree. Everyone feels that way, but since my work is an important part of my life, it's especially true. The sound inside the Orange County Convention Center was deafening this weekend. Hundreds of dogs barking in a large cavernous room will cause that. The AKC/ Eukanuba National Championship was held this weekend in Orlando. 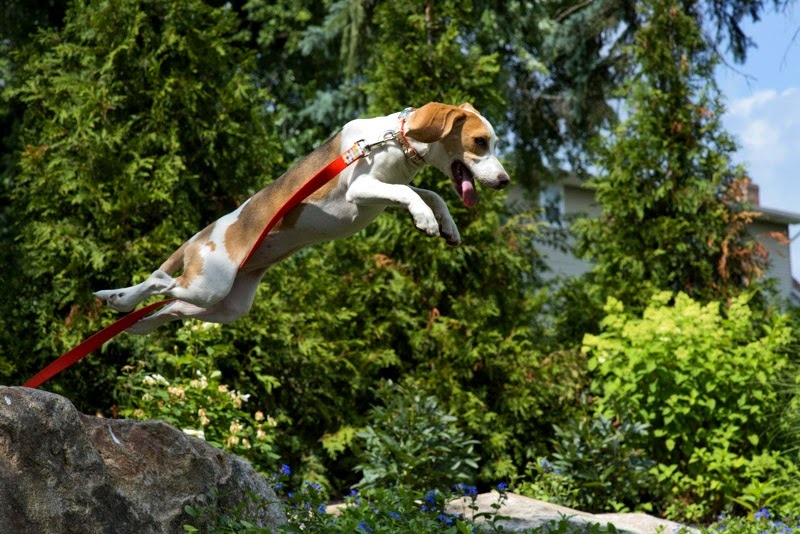 The event is the culmination of a week of festivities, including show competitions, agility, dock diving, grooming and a showcase of dozens of breeds. At the National Beagle Club table at Meet the Breeds. Santa beagle gets photo bombed. The sisters, Birdie and Fergie. Fergie won an award of merit in competition. Here's Fergie with her ribbon. Lulu's trainer, Adam, assists Lina, one of the national trainers for Petco with a Training Basics demo. A young girl in the ring for the Junior Handler's Competition. She's only 9 and she's working with a great dane. The Borzoi group held a Blessing of the Dogs ceremony Saturday. Here, Father Sergei blesses a borzoi. Lagotto Romagnolo. I had never heard of this. It's an ancient Italian breed that now hunts truffles! Spinone Italiani! I want one! Everything at the poodle booth was in camo. This group wants it known poodles are not wussified French doggies. They're German hunting dogs. This young lady is showing Berger Picards. She actually breeds them, and she's a teenager. The borzoi cart. Every year the Borzoi clubs give people rides on this "sleigh." I have more pictures, this is just a sampling. As always a fun event with lots to see and learn about dogs. Plan on being there next year. About a year ago we took you on a tour of a new kennel in Orange County, Florida -- a safe haven for pets of people escaping abusive relationships. 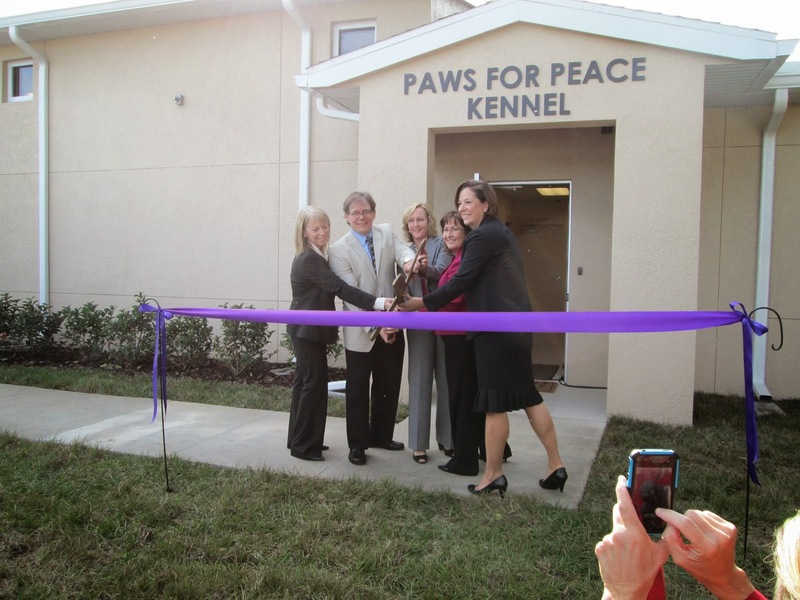 The Paws for Peace Kennel opened last year at the Harbor House of Central Florida complex. The idea for the kennel came about eight years ago. The goal was a privately-funded facility that cared for the pets of domestic violence victims – more like a doggy day care than a shelter. 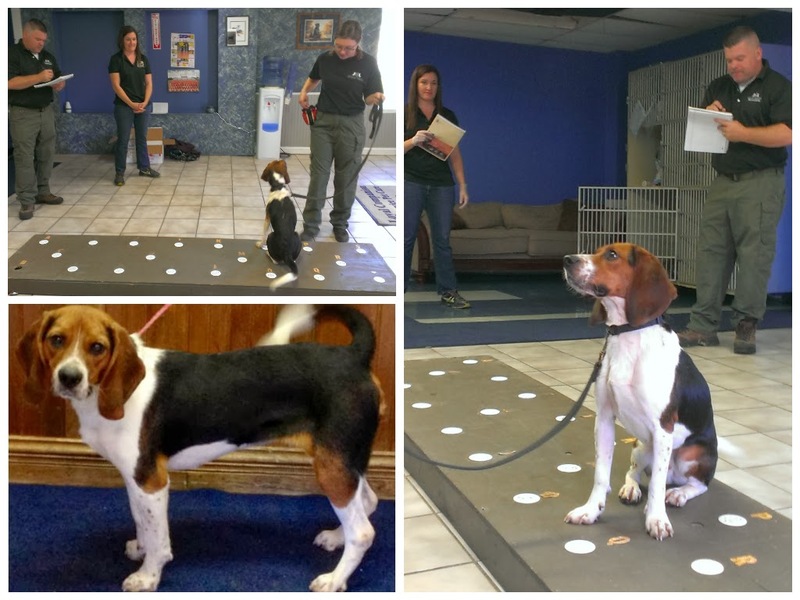 “We had one $50,000 donation from the Orange County Animal Services trust fund but the remaining was all private,” said Carol Wick, CEO for Harbor House. The kennel includes special kennels for dogs, cubbies for cats, dog runs, a park and a cat porch. But the first pet to enter the shelter? A guinea pig. Since then the shelter has also cared for 44 dogs, 14 cats and a bird. Harbor House said 49 families were able to escape their situation thanks to the kennel. Could they escape without their pets? Maybe. However, 48 percent of domestic abuse victims will hold off on leaving because they fear what will happen to their pets. Many shelters do try to find some way to make accommodations, partnering with an animal shelter or rescue. But few shelters across the country have the ability to take pets in, like Harbor House does now. Up to 85 percent of domestic abuse victims say their partner threatened, hurt or killed a pet. Before the opening of the shelter, which services Orange County primarily, Harbor House got one or two calls a week from people who needed a place for their pet. The goal now is to get more shelters across the country to do. Harbor House is now working to help other shelters open a kennel like theirs. Harbor House also continues to raise money and seek donations to keep the shelter going. In April the shelter will host the Paws for Peace Walk fundraiser. It’s being held in April to coincide with National Prevention of Cruelty to Animals Month. 'Tis the season to tell readers that while a cute puppy with a big red bow under a Christmas tree is a cute scene for a movie, reality is not so cute. Are you stressed during the holidays? With the running around, and the messes, and the food cooking and the relatives and friends visiting? So how do you think the new dog feels? And the dog is new to the house. They need your love and patience, two things that wear thin during the holidays. And how many end up at a shelter when they turn out to be more than people can handle? Especially if the dog's a puppy. However, I also know that not everyone reads this blog. Or any pet blog. We know people will do what they want to do. The BEST thing to do is help them make good decisions. So here are some things people want to get a dog should consider. Please share this post with your friends and family. 1) A dog is a big-ticket item. Sure, you can get a shelter dog for $100 or less. But a dog can live 10 to 20 years. US News.com reported earlier this year that a dog can cost around $20,000 over the pet's lifetime. And that's the lower end. So what do you do with a big ticket item? Well you don't just make them. You research, you consider carefully, you discuss it with family members if you have any to discuss with. You should do the same with a dog. It should be an intimate, personal decision. 2) Avoid stores that sell puppies. This isn't even an "adopt, don't shop" thing (by the way -- ADOPT, DON'T SHOP!). I love the Christmas season. One reason is it gives me an excuse to shop. I'm an impulse shopper, especially when I'm stressed. So you're in a Christmasy mood, and you're trying to come up with a gift for a loved one, and you're surrounded by cute fluffy doggies. Too easy to end up walking out with a puppy. And not a puppy who is particularly healthy if they are from a puppy mill. So do yourself a favor and stay away. 3) Consider a promise instead of a puppy. Instead of a dog under the tree, put a stuffed puppy under the tree. Consider it a promise: you'll replace this stuffy with a real pup. Then, when everything has settled down, go to a shelter or a reputable breeder and pick out a dog. You can start the search at websites like Adopt-a-Pet or Petfinder. This gives you time to work out the details -- like who will end up taking care of the dog. FINALLY, A dog is not an impulse buy, and it's not a diamond necklace. A dog is another living being. It should be treated with respect. Don't just pick a dog out and give it to someone. The dog chooses his owner as much as the owner chooses the dog. Pay the dog the compliment of having that choice. Done right, you can have a relationship like the one I have with Lulu. Doesn't she look THRILLED with her pajamas? Tis' the season for Christmas stories, and a furry companion can make the story much more cozy. On Sunday Canine Companions for Independence and the Rosen Centre hotel hosted a Christmas storytelling session featuring celebrity guest Emily Ellyn of "The Next Food Network Star." Keith and Wilma, two CCI pups, sat with the children and listened to the story. Afterwards the kids got to decorate cookies. Canine Companions for Independence trains golden retrievers and labs to help as service dogs, hearing assistance dogs, companion dogs, and dogs to help at facilities. CCI will be back at the Rosen Centre this coming Sunday as well. "Did you hear that, Keith? We're coming back!" On Sunday, Dec. 15 at 2 p.m. Fred Schneider of the B-52s will read "Sassafras Jones and the Search for a Forever Home," the story about a pekingese who is left at a shelter. The reading is free. Afterwards, people can attend a special holiday tea that comes with a dessert buffet, a gingerbread house making contest for prizes and more. That costs $20, but proceeds benefit CCI. Fred Schneider will also sign copies of the book. It's a great way to help service dogs, and it's also a great way to take a break from Celebrate Dogs, which is taking place next door from the Rosen Centre at Orange County Convention Center. 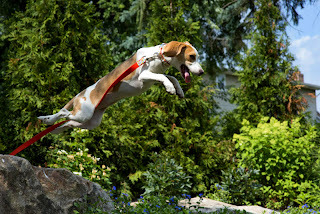 Celebrate Dogs is part of the AKC-Eukanuba Championship. There are other great holiday activities at Rosen Centre, including face painting, time with Santa, ice skating and more! The storytelling spot is next to the big Christmas tree decorated in with doggy ornaments. Each ornament represents a dog that graduated from CCI training. The Rosen Centre is on South International Drive in Orlando. For more information, head to their holiday events website. Sometimes it's really tough to get into Christmas in Florida. 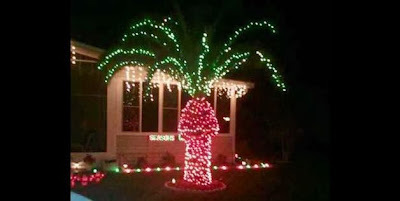 Remember in Home Alone 2: Lost in New York when Kevin's Mom tells him he can decorate a palm tree. THEY ACTUALLY DO THAT HERE! Christmas isn't really about the cold, but if you grew up in New York (like I did) and are used to that kind of Christmas, Florida is not the same. Lulu doesn't get to play in snow. 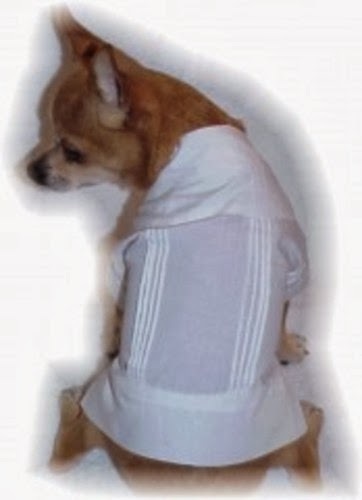 There's no need for doggy jackets, really. The flora and fauna are different. You can do things in Florida that you can't do up north. Which is weird, but if you embrace it, it's also kind of neat. Here's how you celebrate Christmas in Florida with your dog! The guayabera is a very traditional four-pocketed shirt worn among Hispanic and Caribbean communities for hundreds of years. Some independent designers have created ones for dogs. You can buy one off IndieShop, for instance. Then pair it with a Santa hat (because Santa hats are non-negotiable no matter how hot it is). Of course you could also always go with a little Tommy Bahama. That works too. 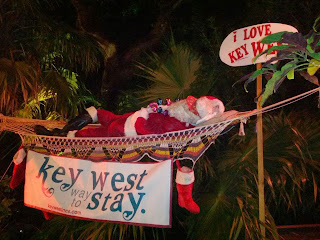 Residential Christmas Display in Miami. Yeah, I know, you've got Christmas lights in up north. But I PROMISE you, it's not like we have them down here. 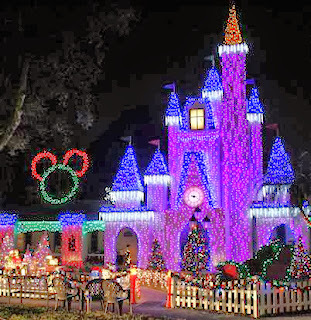 According to the Florida Retail Federation, Floridians spent $800 million on Christmas decorations in 2012. Americans in general spend around $6 billion on decorations. Do the math. Maybe we don't spend the most, but we spend a lot. Especially on outdoors stuff. We don't have to worry about snow. We build CRAZY Christmas displays, with large moving things, and garage displays. We decorate cars and planes and boats. Neighbors get together and coordinate their displays so You have street after street of Christmas lights. Take a look at these neighborhood displays in the Tampa Bay area alone. Looking for Christmas lights by you? Check out this website for locations. A boat at the Jingle Eve Boat Parade in Orlando. Lots of Floridians have boats, and there's no ice to worry about. It's not uncommon to see boats all dressed up for the holidays. 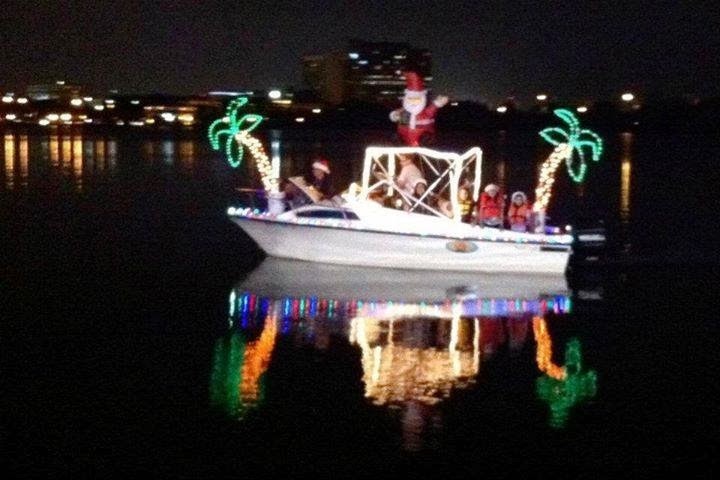 And in Florida you can always find a boat parade nearby during the holidays. Find a boat for you and your dog to ride in, or watch from the shores. That is "snow" on the ground in Celebration, Florida. Every year "snow" falls in the town center at Christmas. Your dog can visit, if they stay on the sidewalk. It's not real snow. It's a foamy substance that mimics snow. 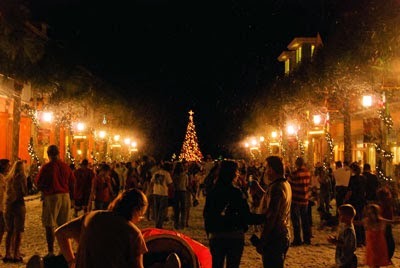 Lots of places in Florida try to recreate that classic Christmas feel with fake snow. Some places do let the dogs play in it. Some of the fake snow substances are safe for dogs to be in, though they probably shouldn't eat it. If I were you though, I would make sure the dog uses the bathroom beforehand. Snow being a rare commodity in Florida, the yellow variety is definitely frowned upon. Key West is very pet-friendly, and every year they have a big holiday fest. There's lights, historic house tours, parades, concerts and more. Bring your pet for the tours, and even get their picture taken with Santa on select nights. It's awful. It's warm enough to go to the beach. And people do it. There are surfing Santas and eveything. Lots of beaches allow dogs (mostly leashed). 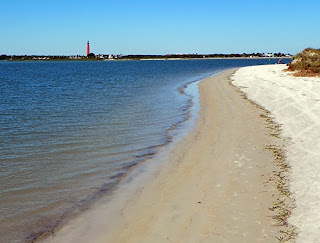 One is Smyrna Dunes Beach in New Smyrna Beach. 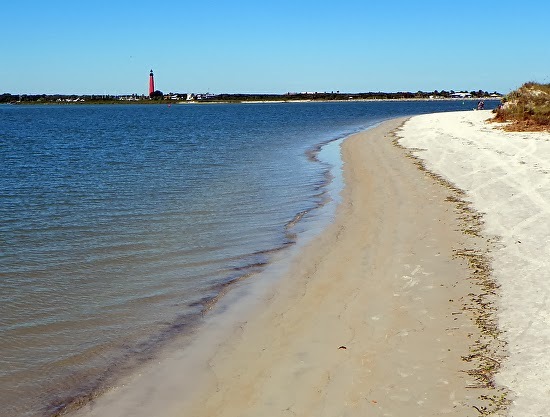 Head to the beach for the day, then check out Christmas on Canal Street in NSB. The city is very pet-friendly. Here's just a few ideas. You can find more at The New Barker magazine, which I write for from time to time. Yes, those big flashy, noisy things that are meant for July Fourth come out at Christmas time in Florida (New Year's too). So remember all the tips about helping your dog through the fireworks. PLEASE SHARE: Do you have any great "Florida Christmas" ideas? Comment below. Who remembers this classic scene from "Ghostbusters?" I always think of this every time I see Galadriel and Lulu lounging next to each other. That picture was from last night, but they've gotten closer in the last couple weeks. Galadriel actually crept up to Lulu and sniffed her. So it is possible. Take heart if there is discord among the species in your house, and also consider these 10 tips from Animal Planet.